Video game publishers continue the successful formula of enlisting hip hop artists to provide songs for the soundtracks to their latest sports titles! Stones Throw Records founder and president Peanut Butter Wolf Presents B-Ball Zombie War, which features songs that are included in NBA 2K8 (available now on most major consoles) and pulls out all the stops, using beats from the late J-Dilla with newly recorded lyrics by MF Doom and Guilty Simpson, Oh No over his own Dr. No's Oxperiment beats as well as all-new and exclusive tracks from Madlib's new group Supreme Team, the newly signed James Pants and more! There's so much to love about this compilation, it is 100% focused on the music rather than the game itself, as this serves as more of a musical companion piece in the vein of other great Stones Throw releases like Chrome Children 1 & 2! 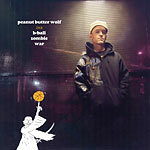 Produced by the respective artists except: 3, 7 & 11 J Dilla, 5 Madlib, 14 Koushik, 15 Peanut Butter Wolf.